Iwagumi aquascaping style is defined by its bold stone formations, elegant simplicity, and commitment to creating a natural setting. Utilizing stones as the primary aesthetic of the design and limited plants, Iwagumi aquascaping style is considered to be one of the more difficult aquascaping styles. The Iwagumi aquascaping style is a subset of Japanese Nature aquascaping that requires a significant amount of experience to implement and maintain. The Iwagumi style follows a general layout that requires a balance between open space, hardscape, and scale between each aspect of the design. “Iwagumi” in Japanese translates to “Rock Formation,” which in turn refers to the stone architecture, formations, and placement defining the features of the design. 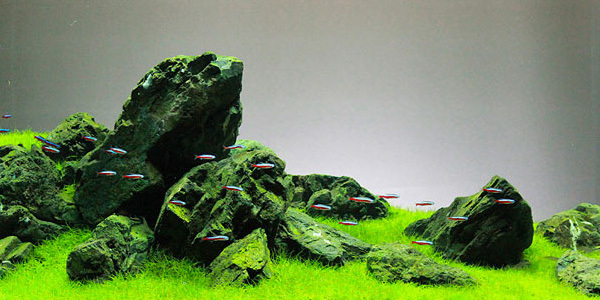 Essentially, the stones in an Iwagumi aquascape act as the structure of the entire design. 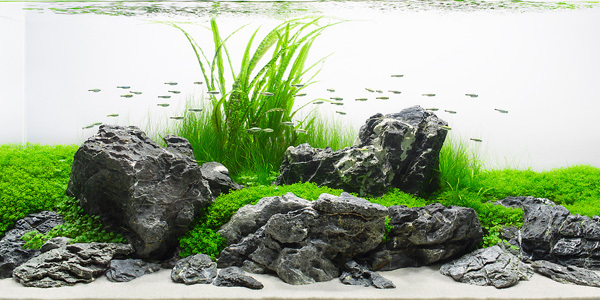 Traditionally, there are three stones in an Iwagumi aquascape; however, the aquascaper has the liberty to build his or her design based upon preference. In the Iwagumi style, the main requirement is to use an odd number of stones, as this prevents portraying the aquascape as unnatural. Creating symmetry and balance in a natural setting is uncommon and is typically evidence of human involvement. Utilizing an odd number of stones prevents the human eye from splitting the design down the middle and creating unnatural symmetry. Apart from stone architecture, Iwagumi style also utilizes fish and plants, but to a minimum degree as the aquascaper should be striving to balance all aspects of the design to reflect simple tranquility. 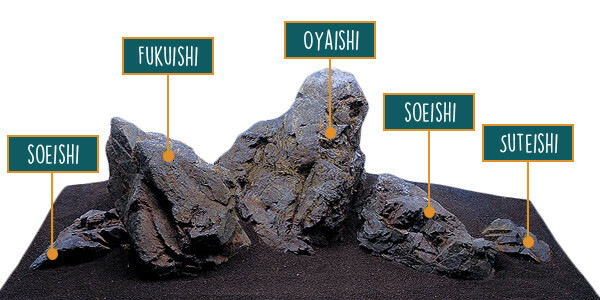 In Iwagumi style, each stone in the layout has a specific name and role to play in the overall aquascape. Typically the largest or most aesthetic of the entire design, Oyaishi is always used as the centerpiece of your Iwagumi aquascape. As the main focal point of the aquarium, the Oyaishi is often angled with the flow of water to mimic a natural river stone. As in Futatsu (二つ) or 2, the Fukuishi is the second largest stone in your aquascape and should be similar to Oyaishi in regards to color, gradient, and tone. Traditionally, it is placed to the left or right of Oyaishi. Fukuishi should serve as a balancing piece to the Oyaishi. The third largest stone, its primary purpose is to accentuate the beauty of the primary stone counterparts. Although Suteishi never stands alone as a primary focal piece of the aquarium, it still plays a key role in balancing the rest of the design. Plants in the Iwagumi style are limited in an effort to maintain the balance of simplicity with the rock formations. 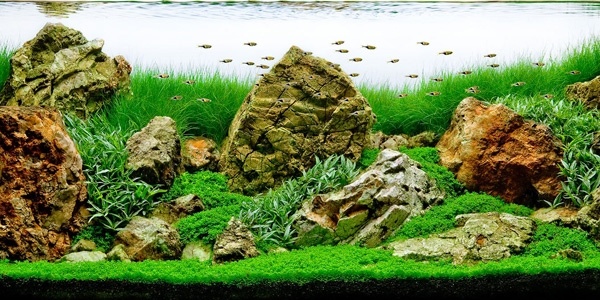 However, it is common for aquascapers to use the benefits of carpet flora and open space. Glossostigma elatinoides, Dwarf hairgrass (Eleocharis acicularis), and Hemianthus callitrichoides are among the most popular selections. Fish should also embody a theme of minimalism and harmony with the rest of your design. The addition of fish to your aquascape should bring about tranquility and life to your aquarium. Schooling fish species like Harlequin rasboras, Rummy nose tetras and Cardinal tetras are most commonly used in this style. 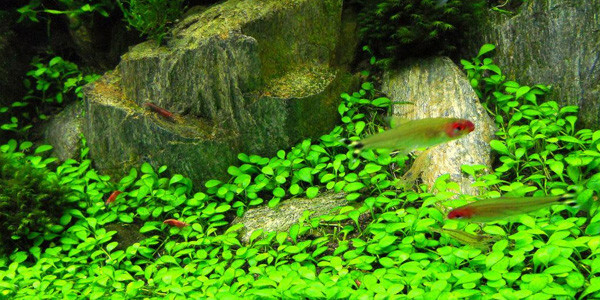 Avoid using individualistic shoaling fish that create imbalance in the aquascape. Iwagumi style may look easier to complete than other more popular styles, however it is quite difficult to maintain. For example, the limited choice on plants makes it arduous to have a sustainable growth process. Plants used in Iwagumi are typically heavy root feeders, making the system between substrate and water filtration a difficult choice for the aquascaper. 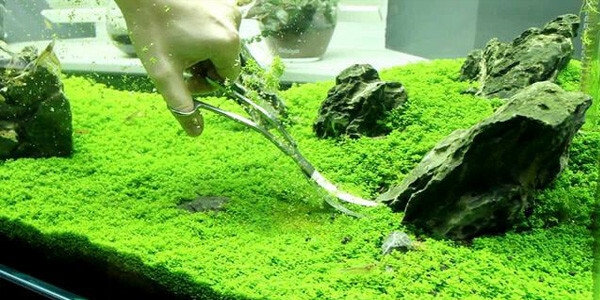 In addition, the aquascape is prone to algae formation at any time during the cultivation of your project. 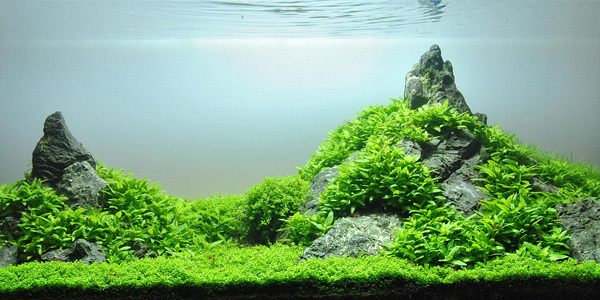 The Iwagumi style is largely regarded as one of the most popular aquascaping styles and embodies elegance and beauty in the aquascaping art form. Although the design may take some time to complete, the end result will bring satisfaction for the work put forth. In addition, the minimal design provides a low barrier to access in terms of getting started; as a result, an aquascaper may be able to get started with Iwagumi much quicker than the other styles that require more resources. 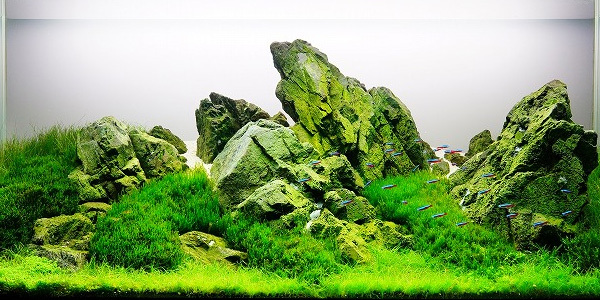 Iwagumi style is also definitive and diverse than other popular styles and gives the aquascaper the opportunity to try a new style when compared to Jungle or Dutch styles. Embodying the Japanese principles of simplicity and spirituality, the Iwagumi style is a hard earned, but rewarding, aquascape.